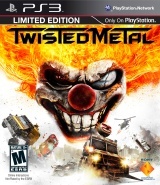 Twisted Metal, the longest running exclusive franchise in PlayStation history and the multi-million selling series is now back, exclusively on the PS3 system. David Jaffe and Scott Campbell, co-founders of Eat Sleep Play and the original creative team behind Twisted Metal, bring back the dark humor, fast-action gameplay and a world of crazy cars, and weapons and destruction. With four factions battling for control, players step into the combat boots of a twisted disciple in a high octane, highly destructible world. Players fight for the prize of one wish fulfilled by the stylishly evil Calypso, the mastermind behind the Twisted Metal tournament. Disciples strategically dismantle opponents in vehicles loaded with weapons of Twisted destruction. With a robust online system, players unleash destruction with up to 16 players through PlayStationNetwork (â€œPSNâ€) and battle through a variety of favorite and new game modes. Twisted Metal carved outfits own unique gaming genre. No other title has Twisted Metalâ€™s perfect mix of dark humor and personality along with massive destruction in a distinctive atmosphere and vehicles and weapons that act as extensions of each character. -Supports up to 16 players online through PSN. -Play with friends in 2- 4 player split-screen and online as well. – Featuring a variety of gameplay types including seriesâ€™ favorite and new, unique game modes. With the power of PS3 system, unleash massive amounts of destruction in brand new, never before seen Twisted levels. Deliver destruction to strategically change the face of the level, or just cause incredible chaos. Featuring a complete arsenal of weapons that make for more creative kills, from missiles and miniguns to giant magnets and flying mascots; players always have a way to take someone out. -Choose from over a dozen Twisted vehicles, each outfitted with special weapons to strategically dismantle opponents. -Flight is a first for the franchise. One of the new vehicles in Twisted Metal to take full advantage of flight is the Talon, a helicopter armed to the teeth with a minigun turret. -Disciples team their rides up in various modes to wreak havoc on the enemy such as using the Talon as a magnet to pick up teammates and rain double the destruction down below. Fight for the prize of one wish fulfilled by Calypso, the Twisted Metal mastermind.